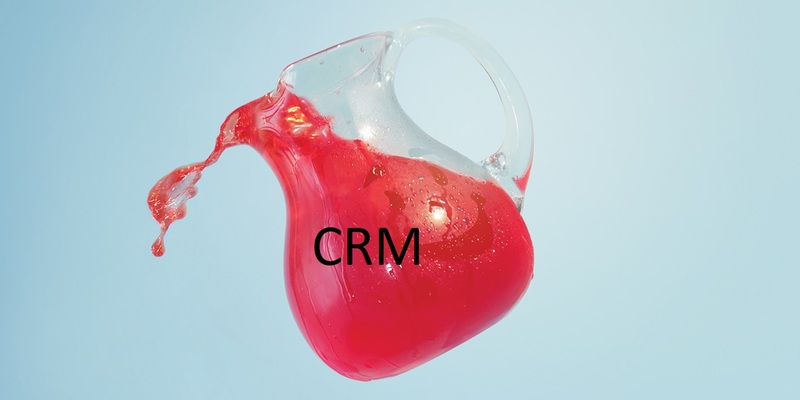 Does your organization need to consider a new Constituent Relationship Management (CRM) system? Is CRM Selection on the table? Have you explored the market? Secured responses to an RFP? Conducted demonstrations? Starter or even completed conversion to the shiny new CRM?…. only to find you didn’t get what you needed? Or, you got to the 20 yard-line? Or, you now need to buy another application or two to get whole? Welcome to the club. Too often in these processes, organizations drink the “sales kool-aid” from vendors, get “wowed” during demonstrations, and are left with an 80% solution, locked in due to fine print during a CRM selection process. Two of my clients are dealing with this issue right now, as in, today...a dozen or so face it each year. My company Zuri winds up parachuting in to way too many problem implementations due in part to these fine print situations. Bluntness and Discipline. Don’t mince words with your vendors. Record and remind them of what they promised. Stick to your guns, the script, and the schedule. This also means you need to watch out for scope creep so you aren’t the cause of delays, bottlenecks, or wishful thinking. Zealous Advocacy. Remember that you are your organization’s best line of defense to avoid being sold on sub-par solutions. Ask for the moon. Expect great results. Don’t accept that first or second “no” from a vendor. But, follow the plan that is in place and persuade your colleagues to get on-board. Red-Lining. Never sign a contract before a careful review. If there are terms that are unclear, get your red pen out and mark up the document. Watch for broad or simplistic language like “will be completed in a standard fashion”. Nope! Instead, mark those up to read “…in a fashion accepted by [insert your organization’s name]”. Skip/Script the Sales Pitch. Bright, shiny sales pitches often get us into this mess. Don’t allow the vendor to show you the sizzle and ignore the steak. Instead, script the vendor’s demonstrations to prove that gift processing, prospecting, direct response, stewardship, and analytics work actually work in the proposed solution. Heed the Advice of Others. Finally, make sure you listen to what references (or lack thereof) are telling you. A vendor that states “we only share references during the contracting phase” probably have a lot to hide and hope you’re too far down the path with them to pull out. So, make those calls and then circle back to vendors to resolve the gaps in the pitch versus the performance. That last thought is a little self-serving. This sort of CRM Selection counsel is what we do everyday. I’d submit we’re pretty good at it. So, if Zuri can help, drop me a line (and hold me to these same points!). Good luck. 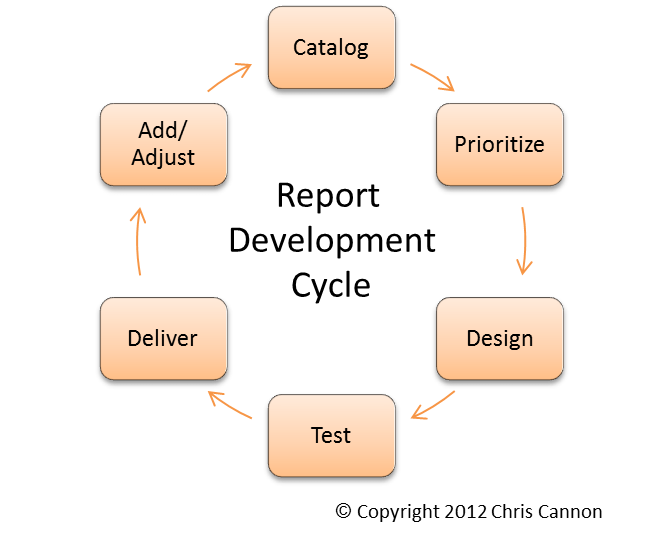 Reporting, a central solution for advancement programs, is failing to meet demands. The trend for the survey suggests that “common” issues (like gift processing) received better satisfaction scores whereas more innovative and new areas, such as social data management (which only a few companies, like EverTrue, really address) and analytics, received lower satisfaction scores. 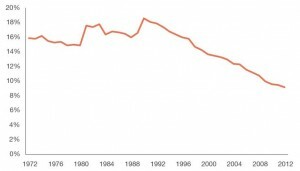 Some of this may simply be the typically slow technology adoption our industry experiences. However, it is important to move beyond the “we don’t have the money/time” argument and start to examine the roots of these issues and how your institution can begin to improve satisfaction. Our users clearly want more and better solutions. There are some solutions and some ongoing obstacles to improving the advancement technology landscape. To solve the issue, non-technical tactics like building trust and negotiating expectations are more important than you might think. Delivering on the fundamentals–accurate, complete and timely data–and adopting a PR-style, metrics-driven strategic information management approach will gain some favorable survey points. However, the lack of funding for, and innovative technical solutions to, fundraising applications remain pretty substantial problems. Thus, expectation management will be a critical component of your effectiveness. What is your team experiencing? How have you improved user satisfaction at your institution? Share your best tips and tricks to help tackle this ongoing challenge. Thanks to a fantastic group at #devserv2014 who walked with me through the world and future of CRM. Fewer than 1-in-10 alumni give back! What are you doing about this? And, how long will it take you? Now or never. 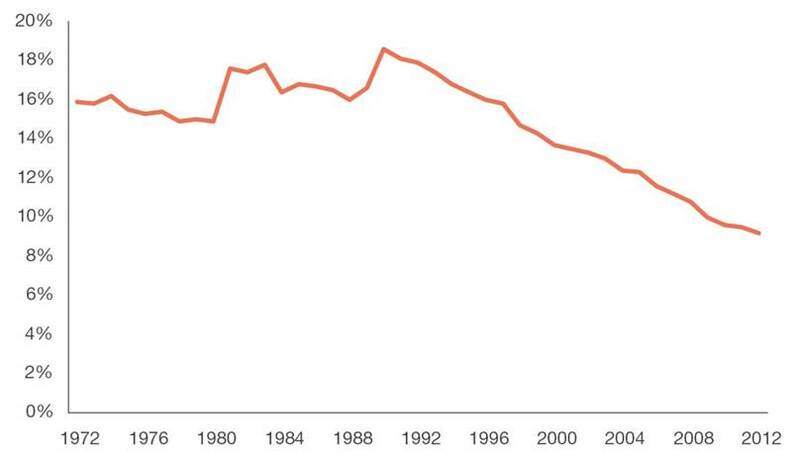 If you don’t reach your grads from the last 10 years (often called GOLD—Graduates of the Last Decade), they tend not to be reclaimed. Life and other philanthropic interests just get in the way. Competition is fierce. As the hyper-successful ALS ice bucket challenge is proving (and Kickstarter, fundme, and other “give-right-now” opportunities reinforce) there are only so many disposable income dollars. Giving is typically 2% of GDP each year; it doesn’t rise or fall much, and, in 2013, Warren Buffett was about 1% all giving in the U.S.! 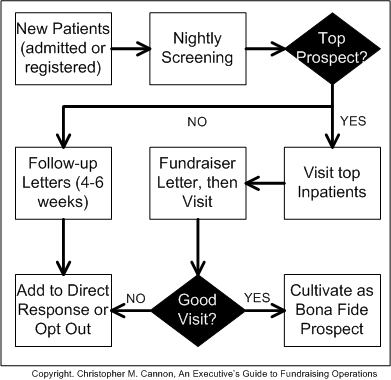 If you wait to engage donors on your timetable, other nonprofits may slide in ahead of you. Education is changing. The days of “the best four years of your life” as a case for support are changing. Campus-based higher education will not be replaced, but many alums did not and will not really imprint with their alma mater. Many institutions are trying mightily to change the trend. The costs can be great and the return can be fleeting. A few benefit from tightly knit alumni bases with a culture of philanthropy But if yours doesn’t, you need to act. Given the three reasons for alarm, your annual giving effort must change, potentially radically. Direct mail? Sure, but no longer on your calendar…move mailings to gain preemptive gifts from those who will be poached by other causes. This point cannot be emphasized enough. Your competition isn’t just the crush of holiday mailings which may drown your year-end mailing; the real competition started yesterday, doesn’t care what your mail house schedule is or how long it takes to get an appeal letter approved, and–by today–may have siphoned hundreds of your donors’ disposable income away through crowdfunding, self-funding sites, slick Facebook apps, and other tools that higher ed has been slower to adopt. Phonathon? Yep, except work harder to get cell phones and build a texting-based strategy. Social media? Of course, but don’t expect “ice bucket” results. Instead, start with data and analysis, identify and engage well-networked alumni and ask them to tweet, like, and post on your behalf. Peer-to-Peer? Many in higher ed have great success with “class agent” models. These need more sophisticated tools to support more wired alumni groups. Excel files emailed on an occasional basis are not going to do it for most alums who want to help. Email? Yep. But, as with cell phone and direct mail, data quality and targeting must be improved. If you don’t have the budget or the base to tackle the issue, there is a less palatable option—change your focus. We all know US News & World Report is a beast that must be fed. However, only sizable percentage gains will likely affect your institution’s positioning. With your data, annual giving avenues, and donor behaviors, is a 20% gain at all feasible? How much will that pull up your ranking? Most will find that this is a stretch goal, at best. So, dive headlong into retention and upgrades as parallel measures of success. Bring up average gifts…literally by generating larger averages and tactically in board presentations and as metrics. The future of education may be so different than anticipated that any predictions will be way off. However, this doesn’t mean that preparation and reinvention should be postponed. In fact, because we don’t know what’s coming, we must immediately tackle the sliding participation of our young alumni while working diligently to retain or reclaim more seasoned alumni. Hope is not a strategy so get going in changing your approach to changing alumni behaviors. An interesting visual depiction of spurious correlation (check it out here) reminded me of my grad school days and the rigor with which I would build hypotheses. Rather than let R, SPSS, or Excel correlate away and then proclaim some amazing finding, I started from the reasons and results I expected to validate with data. The difference is, all too often, that the former approach tells you very little due to endogeneity, spurious results, and the lack of context. Some organizations–Google is known for this–will say “don’t worry about the why”. Some have referred to this approach as “theory-free“, a nice euphemism to indicate how little long-term value we might find in these correlations. Now, for consumer behavior where Big Data is truly present perhaps this works. But, data points are rarely available for nonprofit analytics in the same way as, say, Target and Wal-Mart have data…although there are new options underway, like David Lawson’s newsci.co. And, if you talk with a gift officer who’s been disappointed with predictive modeling results, you see a different picture. From that vantage point, the analytics results are frequently devoid of context. The result confirm what we already knew (“these prospects look rich! they live in a nice neighborhood!”) or reflect a pattern we already see (“they gave last year! let’s ask them again!”). Yet, modeling doesn’t typically improve relationships with prospects. The solution to this issue isn’t to cast off analytics. It’s to improve it. Start with and add in theory. Guard against spurious results. Don’t elevate an endogenous variable as meaningful. And, most of all, our industry needs resources that can actually add context to results. As a student of philanthropy, I am anxiously awaiting the time when our new science of analytics better delivers on the hype and improves our understanding of donor behaviors, while avoiding endogeneity and spurious results. …didn’t you know that? Of course you didn’t. With the holidays, closing some year-end gifts (not to mention the books), and learning an awful lot about Amazon’s post-holiday online return policy, how could you keep up with all of the information being thrown at you. It’s hard enough to have the right information, much less use it effectively. 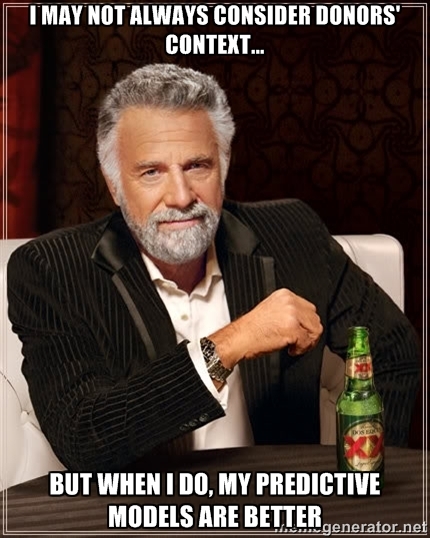 Plus, it’s not really National Business Intelligence Month. I made that part up. So, why the subterfuge? We need to draw attention to the critical need in the advancement business for more and better reporting and analysis. Some of you already have what you need. Some stopped looking years ago. Some have that “special” report that some poor person spends hours to prepare. But, most of us want better reporting, the kind that actually helps us make decisions about the business and tells us things we otherwise wouldn’t have known. Better reporting requires a few things. This flow chart shows the way to better reporting. But, even more important than creating reporting is turning it into business intelligence. Let’s work to get even better data into even more clear reports that drives even better decisions. Let’s stop with the ad hoc, don’t-really-learn-much urgent reporting and develop a thoughtful suite of reporting that allows you to direct the team. Let’s develop shared definitions and expectations, allowing our reports to mean the same thing no matter the audience. So, know that I think about it, let’s make January National Business Intelligence Month. Make sure to put it on your calendar for next year.